I really hate the idea of paying a lot for a meal I’m going to cook at home. I think this is a reasonable expectation. After all, I have to put in all the effort to prep and cook the meal. I generally don’t like my in home meals to cost more than $8 a plate, maybe $10 for a good steak, to prepare. After this, I almost feel like the cost vs. the time and effort to prep, cook and clean is just not worth it. 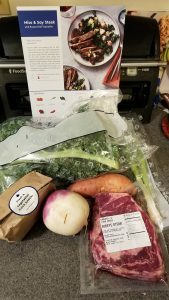 This is why I am so hesitant to sign up regularly for a meal delivery service like Hello Fresh, Plated, Blue Apron, etc. Most of them work out at regular price to $12+ a plate. 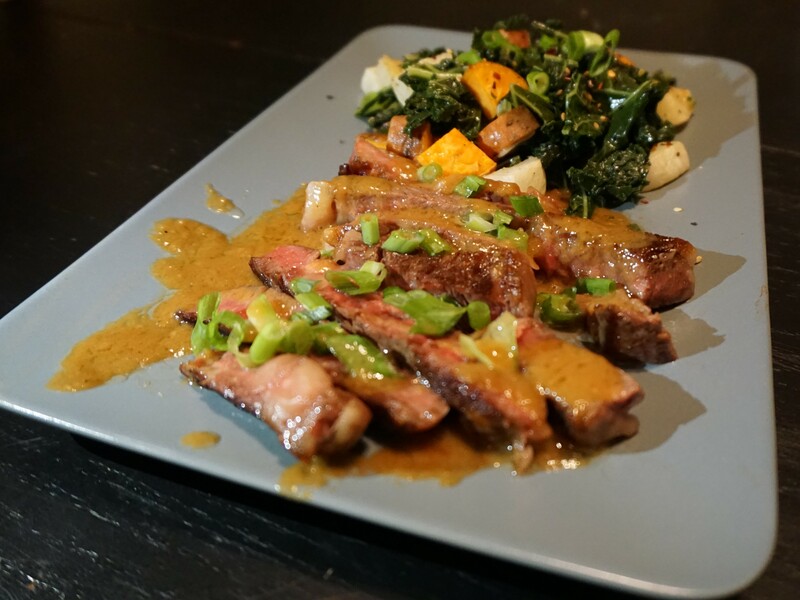 I had tried Plated in the past when I was provided a free shipment. It was ok. My recipes were always so basic and the quality of the ingredients wasn’t so good. After I accidentally forgot to cancel and received a box at full price I said I was done. 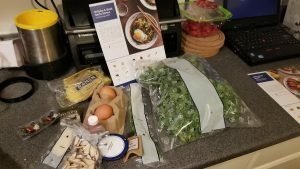 Recently, I made the decision to try Blue Apron. It was Thanksgiving weekend. Black Friday sales were in full force. I had already spent way more than I wanted. 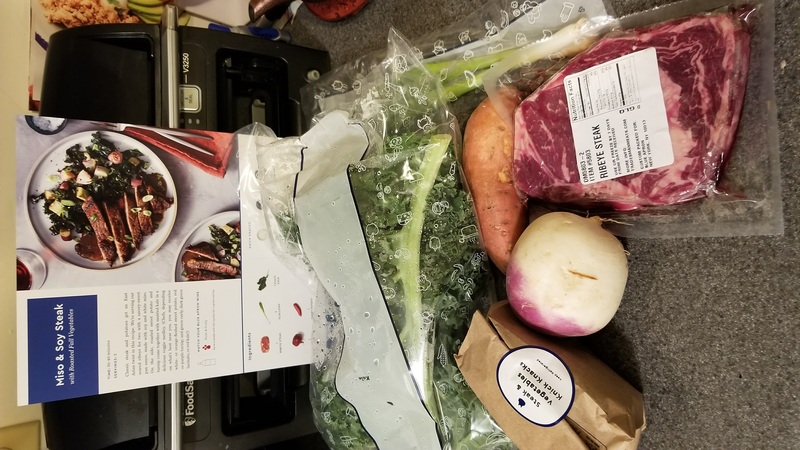 Blue Apron was offering 50% off the first 2 boxes. This was 4 meals per box at $7 a box. I was sold. 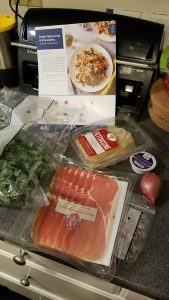 I gave over all my info and selected some recipes to try. 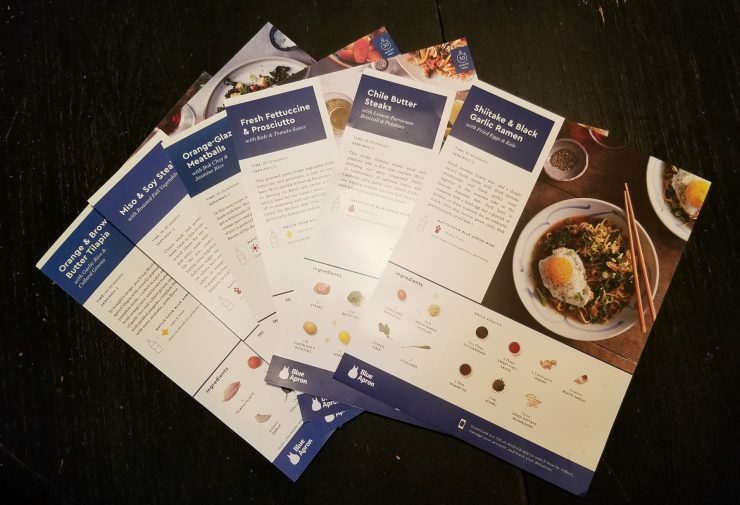 First thing I will say, the Blue Apron recipes are for meals that you might not think to make at home. The second thing I will say is the recipes were pretty simple. However, the third thing I will say, if the recipe says 30 minutes, expect it to take longer. My first box contained more kale than I have ever eaten in my life. 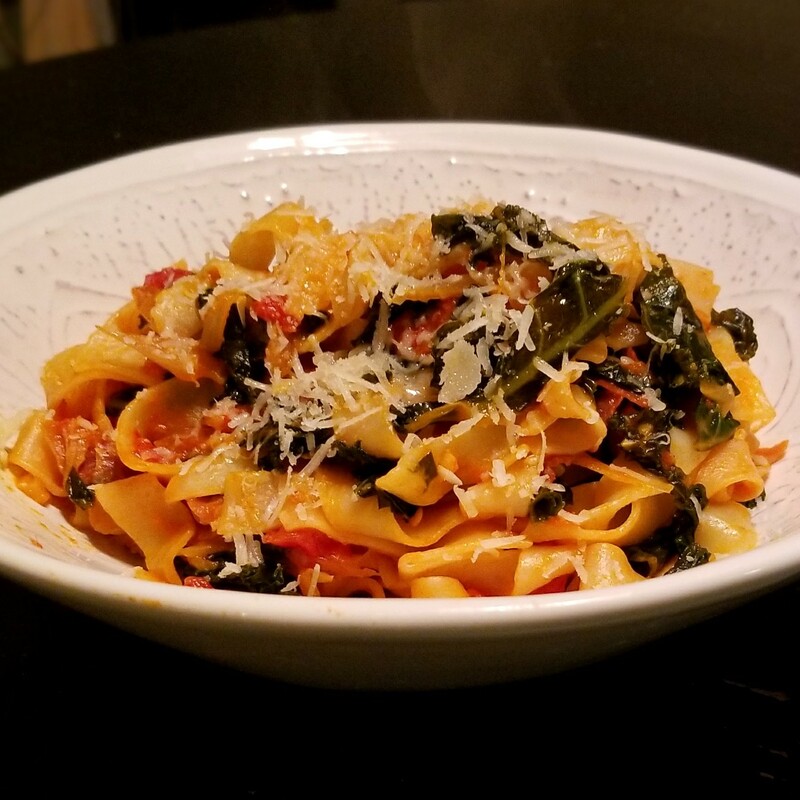 The recipes were for steak with miso glaze and kale with potatoes, and Fettuccine with Prosciutto and kale. Every ingredient is very clearly labeled if it does have its own label or it’s not something obvious like a potato. All my ingredients were very fresh. Nothing had turned brown. Nothing was wilted. I was pretty happy with the quality. This was so easy for a meal that required cooking three parts separately. I had to do the potatoes, kale and steak all separately. The potatoes and turnip were the easiest. Just chop, season and bake. The kale was a little more involved. Kale needs to be properly chopped, sauteed until just slightly wilted and then seasoned. Cutting a full bag of kale is rather time consuming. I’m not sure kale is ever worth this much effort. The steak was a good size and cooked nicely to medium. The miso sauce was pretty easy to make too. The whole meal came together pretty well. 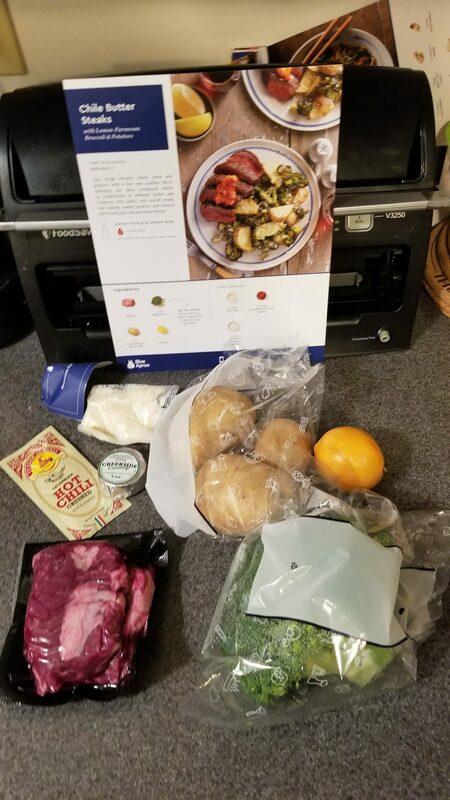 For the first attempt from Blue Apron, I call it a success. It was pretty good upon reheating for plate #2. Starting with cooking the prosciutto. This is similar to cooking bacon, but for a dish like this it should be kept a little more soft. Then there was chopping up kale and sauteeing again. Adding some crushed tomato and some fancy cheese to make a sauce. A nice touch is that Blue Apron sends fresh fettuccine instead of boxed. It did take a couple minutes longer than suggested to cook, but I think that was because I didn’t bring it to room temp first. This meal was really easy. Still took me longer than the suggested 30 minutes, but not too much longer. This dish also reheated pretty well for the second serving. My first box was a success. Turned out much better than any experience with Plated. Both the main night and the reheated second dish were great. A couple weeks later I was ready for my second box. Alright, making ramen at home was little more difficult than I expected. This required chopping and sauteeing kale again. Then rehydrating and sauteeing mushrooms. Finally chopping black garlic, which I think this was my first time having black garlic and it’s amazing. 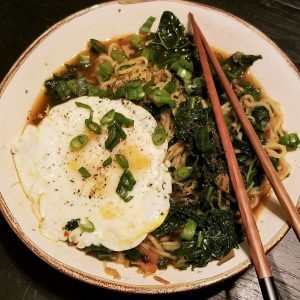 Then creating a broth, boiling noodles and frying an egg are all separate parts. This all took much longer to prepare than I expected. It was still easy, but just more time consuming. This was delicious and almost hard to believe I made at home. This was probably the closest to a restaurant quality meal of the 4. It also reheated very well. The only part I made fresh was the fired egg. I think this was the easiest, but probably also the least creative meal I ordered. It was very basic. 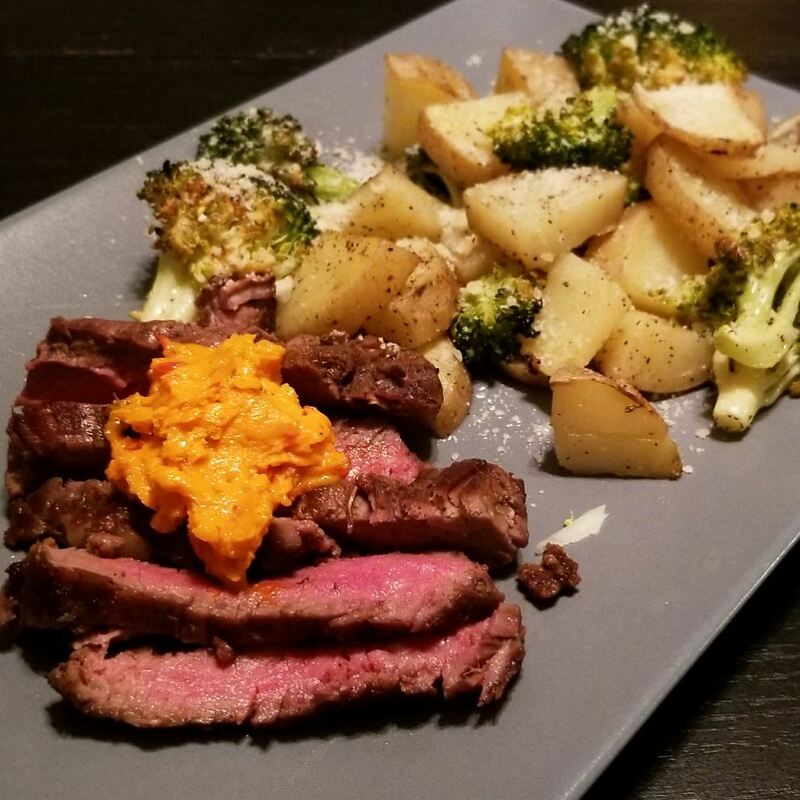 Chopped and roasted broccoli and potatoes, pan fried steak, chili sauce and butter combination. It was pretty good, but probably the only one of the dishes I wouldn’t make again. The chili butter was good, but not great and not enough of a seasoning to make it special. A plus for this one was I think it took me less time to prepare and cook then suggested. Overall, Plated was pretty great. I plan on doing another box soon, at full price (gasp! ), when I don’t think I’ll have time to do grocery shopping and I have become tired of leaving my house in this unreasonably cold winter. I also want to try to do some other meal services. I’m open to suggestions or being sent free boxes.